*Disclaimer - I received the product in this post from Nickelodeon Home Entertainment, in order to facilitate this review. Are you wanting to see more of Spongebob for your kids? I grew up when SpongeBob was a big show on TV and loved it, and now our kids are able to enjoy it too, especially our younger two. They have fun watching the DVDs I get of him. SpongeBob SquarePants and all of his Bikini Bottom friends are back in a new DVD collection, SpongeBob SquarePants: Holiday 2-Pack. 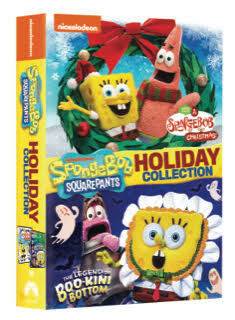 This two-disc set contains two holiday-themed stop-motion specials; It’s a SpongeBob Christmas, where Plankton turns everybody in Bikini Bottom from nice to naughty, and The Legend of Boo-Kini Bottom, a spooktacular special where SpongeBob must be scared straight in order rescue his friends from the Flying Dutchman. These holiday specials are currently available on DVD and are sure to brighten up any Halloween Christmas stocking. Plankton turns everybody in Bikini Bottom from nice to naughty by feeding them his special jerktonium-laced fruitcake all in an effort to get his Christmas wish--the Krabby Patty formula. The Flying Dutchman comes to Bikini Bottom to make sure everyone in town is scared--especially SpongeBob, who seems to be unflappable in his belief that spooky things are actually funny.